Habs legend Larry Robinson was first overall pick to play in the Molson Canadian Sens Alumni & NHL Celebrity Cup, a one-day charity hockey tournament held in Ottawa on Friday and presented by Bell. The nine-time Stanley Cup winner was snapped up at Thursday night's draft party by the M.Y. Blues team. It earned itself first pick after raising by far the most money – $40,230. Team members Steve Dumouchel and Sylvain Yelle of Maurice Yelle Ltd. were also top fundraisers. Collectively, the 14 teams brought in $217,000 for the Ottawa Senators Foundation and its efforts to enrich the lives of children and youth in our community through programs that promote their physical and mental wellness. 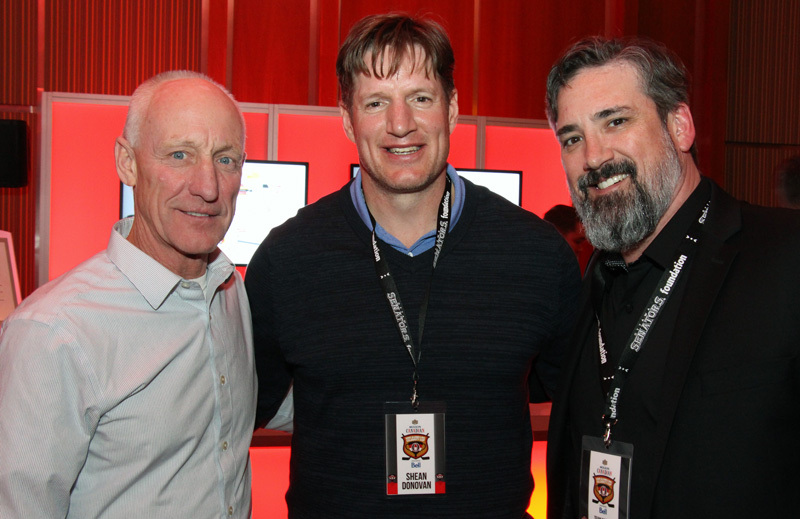 The event featured 14 former NHL and Senators players, each of whom was drafted by a participating team and joined them in a one-of-a-kind, three-game experience. At the end of tournament play, top individual fundraisers formed an All-Star team and competed against the entire alumni roster. The hockey-loving players got together at the Brookstreet Hotel for a fun and relaxed gathering, hosted by Ian Mendes of TSN 1200 Radio with hockey trivia expert Liam Maguire. The dress code was business casual, which gave guests permission to wear their brightest and boldest Don Cherry suits, if they so dared. The teams that raised the most money got to choose first while the last four teams picked randomly. The drafted players then signed one-day contracts with their new team. Recently retired Chris Neil may be one of the most popular players in the history of the Ottawa Senators but he didn’t expect to get drafted before Robinson or Denis Savard, another hockey hall of famer. Neil took a long and celebratory swig of beer after being selected by third-highest fundraising team, Capital Ridge, an Ottawa-based recruiting agency. The room heard how its founder, Paul Dogra, suffered a heart attack on the ice during a recreational game at the Minto Sports Complex prior to last year’s charity hockey tournament and had been unable to play. Dogra has since recovered and was at the draft party this year. He made a celebratory toast to the Ottawa Senators Foundation and to the game of hockey while on stage. He also thanked three men standing alongside him – Steve Janega, Kendrick Au and Yves Goyette – for saving his life. The men had acted quickly to perform CPR and administer the defibrillator after his heart stopped. “Listen to your body because I didn’t. Get checked,” Dogra told the room. In Dogra’s absence last year, his team selected Dennis Vial as its draft pick. The team was drawn to the former NHLer because, like Dogra, he, too, had suffered a heart attack while playing hockey. The roster of players was: Radek Bonk, Eric Daze, Shean Donovan, Jody Hull, Denny Lambert, John LeClair, Pascal Leclaire, Darcy Loewen, Sergio Momesso, Neil, Chris Phillips, Robinson, Savard, Steve Thomas and Vial. Due to his chronic back injury, Phillips was only to be in the final game, played between the celebrity all-stars and top fundraisers at the Bell Sensplex. He attended the draft party on behalf of Bonk, who was unable to be there but told the room, via video message, how much he was looking forward to playing in the tournament. Bonk encouraged everyone – well, almost everyone – to enjoy themselves at the party. “My team should go to bed early,” joshed Bonk, who was selected by the fourth-highest fundraising team, Bell. LeClair was drafted by the Bjorn Jets, who placed second in fundraising. Its choice had less to do with on-ice performance expectations and more to do with the team just wanting to hang out with the guy and listen to his great hockey stories. Bilodeau travelled to Iqaluit three years ago with LeClair. Also on that trip was Bilodeau’s hockey teammate, Ottawa lawyer Lawrence Greenspon, and former NHLer Marty McSorley. They delivered brand new children’s hockey equipment, donated to a non-profit organization called Project North. Scotiabank is a sponsor. They also brought the Stanley Cup and played in a VIP hockey game. LeClair seemed like an obvious choice, said Bilodeau. "We have a history of doing great community things together and making an impact."